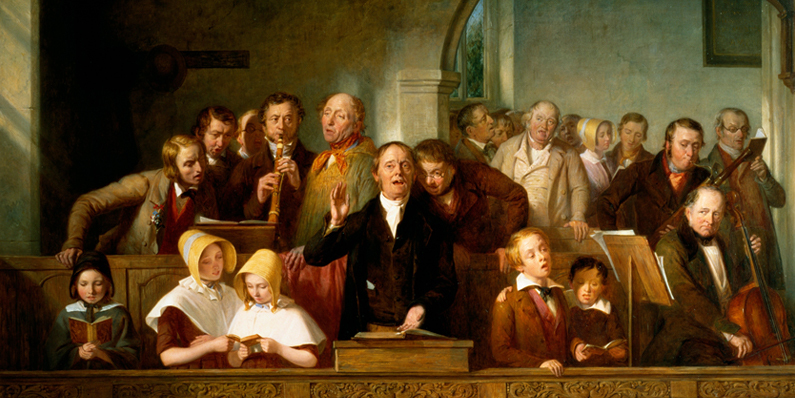 Image: The Village Choir, 1847 by Thomas Webster (1800–1886). Ward choir directors are called by revelation and qualified by the Lord as they act in faith. 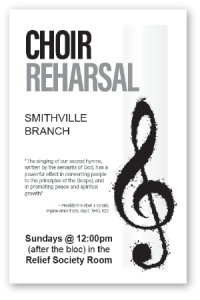 In part, that faith is exercised (and tested) by simply getting choir members together to rehearse. When ward choir members receive personal invitations to sing, they will come to rehearsal. If you’re starting from scratch (or even if you’re not), begin by making a personal invitation to each choir member. Gratefully accept those who can come, be understanding and supportive of those who cannot. Some may be too timid and others simply too busy in their current circumstances. Over time, circumstances and confidence levels change. Wait for a season and invite them again (perhaps at the beginning of the new year or after they’ve been released from a particularly demanding calling). When they’re ready, they’ll remember your personal invitation and they’ll be more likely to accept the next one. Of course, that means you have to keep on inviting them. Invite all to come unto choir. Extend the invitation to everyone. Include choir notices and rehearsal schedules in the sacrament meeting program and make sure they get announced to the Primary, Young Women, and Young Men. Ask the ward council if there’s someone who could use a specific invitation—they almost always of know someone you do not, who would love to participate if invited. Don’t forget to remind them. 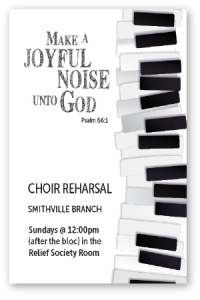 Remind choir members about each rehearsal and performance with a phone call, text, email, or even a hand-written note or typed flyer. Even choir members who love to sing and regularly attend rehearsal get busy and overwhelmed. A gentle reminder with a note of encouragement can help them during a busy or trying week. When ward choir members feel accepted, they will come to rehearsal. So we just kept singing. And it was fine (the angels helped). And, his example encouraged more family participation and soon we had an entire section of young children, happily singing along with mom or dad. It was a good opportunity for primary songs in two parts. And it was fun. Most importantly, the music invited the spirit and everyone, including the congregation, could rejoice and be edified together. When ward choir members see consistency, they will come to rehearsal. Setting up the schedule tends be easy. Continuing to hold rehearsals when attendance drops to only a few members—or none at all—can be much more challenging. But, as with good parenting, consistency shows real commitment. So keep going. Ironically, consistent rehearsals can be a big motivator for busy members. Because they have so little time available, they wonder spending it at choir rehearsal be worth it—and an inconsistent schedule makes them nervous. When the ward choir director demonstrates consistent commitment to rehearsing, choir members often make an extra effort to attend. My ward choir currently rehearses each Sunday (except Fast Sundays) and sings in sacrament meeting once a month. During the fall, we practice a bit more for the Christmas program. We return to a regular schedule from January through May, when we switch to a lighter summer schedule (once a month rehearsals and performances). Sometimes we break completely during August and then start the process over again in September. Of course, different circumstances may necessitate individual adaptation. In smaller wards or branches, where everyone wears many hats, it might make sense to rehearse and perform just once per month, perhaps even on the same Sunday. 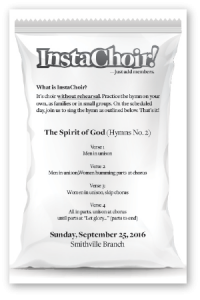 You might also try InstaChoir™ (just add members): announce an upcoming date to sing in sacrament meeting and then ask choir members to practice on their own. On the appointed Sunday, the InstaChoir forms and sings as planned without any formal rehearsal at all (a very simple arrangement, usually out of the hymnbook). Whatever schedule you create, commit to it consistently. and always, always end rehearsals a few minutes early. 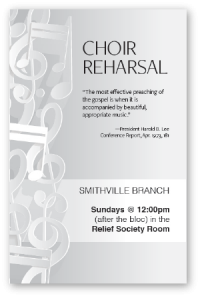 This will surprise and delight your ward choir members, and encourage greater participation. In addition to personal invitations, acceptance, and consistency, I also recommend enthusiasm (confidence), understanding, and gratitude. Read more in Part 2.